Hiking in the forest – a living network? Can the forest be seen as the largest living social network of the planet, and might we one day be able to connect to it? I know it sound too far out, but biologists have long been wondering if trees and plants might be communicating together in a sustainable, ecological version of the World Wide Web, something they often call: “the Wood Wide Web” – an incredible large and old, living social network. Indigenous people and pagans seldom doubt that this network exist – or their belonging/part/home in it, and there are examples from all over the world of people who consider trees to be both sentient beings and near relatives, that need to be respected and cared for. In our modern global culture trees are seldom described in this way, but still, in some of our most popular storytelling, from Tolkien to the Avatar movie, living trees are still among the main active characters. Out on the trails many hikers describe the experience of hiking through forests as a very unique and sometimes even spiritual journey that might partly explain why some of the “green tunnel” trails, like the Appalachian Trail (USA) and The Black Forest Trails (Germany), where the hiker is hiking through forests most of the way, are among the most popular trails. Maybe it is not so strange that hikers, when out walking, in many ways feel connected to nature in a way that somehow assemble the nomadic cultures and wanderings of the ancient cultures that used to inhabit the forests when they covered much more of this planet. But today most of us live in a very different urban reality where forests are something we have little daily connection with, and theories about what the far away woods might do, is not what most of us think most about. But while most of us have lost our contact with the woods, scientists have started to wonder if trees might be seen as an advanced and connected community of network builders. Just with a much slower and longer time frame than ours. Something these scientists now think could explain some of the strange results they get, when using new and advanced technology, measuring, analyzing and testing the way forests and trees grow and communicate. For science this is something that needs to be researched much more. 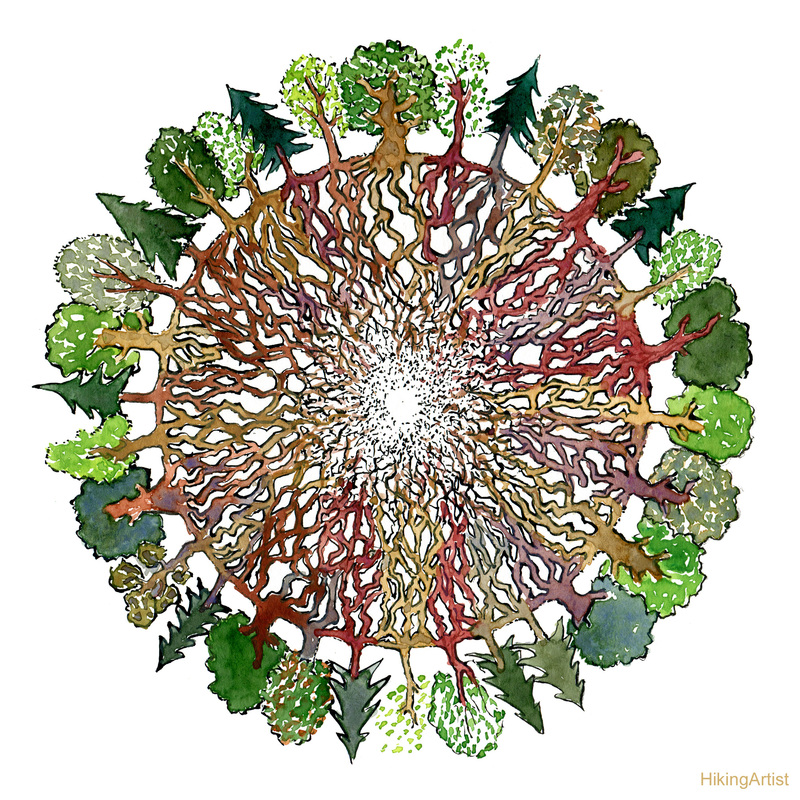 For a hiker who wander through the woods, this might give a whole new layer of meaning to the hiking experience – if there is just a small chance that the trees along our forest trails are somehow connected in a living gigantic, green social network, that evolve around us and can sense us as we walk past the individual trees. Some scientists believe this is the best explanation they can give right now: A living network that has been evolving, connecting roots, sharing genes, information and collecting knowledge of its experiences and connecting the individual trees together for hundreds, sometimes thousand of years, in more complicated ways than our current theories fits, but that we now know include things like airborne communication and chemicals, soil layers, fungus collaboration, sub-soil carbon exchange, brain cell like structures, electrical signals, hormones etc. not only above, and around us, but even more so underneath our feet, where 2/3 of the living forest is actually situated. In the movie Avatar these thoughts were taken to the next level (Avatar Pandora link), so to say, in a vision of a far, far away planet, where all its different lifeforms are connected as living parts of a huge evolving ecological network. Could it be that the Avatar vision of a distant planet, could be something going on here? And that we, one day in some strange way, will be able to, if only for an ever-lasting second, to somehow connect with this network… not in a galaxy far, far away, but right here on Earth?